Greetings all. I’m all wags today. I heard back from my dogtor with my lab results. Actually, it’s too hot and I’m too lazy be all wags today. But, I did want to let you know that my blood tests and stuff came back PERFECT. Yes, that’s what DoGtor Elliott said about me. Nothing wrong with me! And nothing to worry about at the moment. Whew. Except for one thing. I’m perfect, yes, but I’m overweight. DoGtor Elliott refuses to use the word “fat” to describe me. Thank you for that. As for me, I don’t care. As long as my tam o’shanter fits. That’s all I care about. And I don’t have a fat head, though some would dare to disagree I’m sure. And, yes, now we know I don’t have a thyroid problem or anything else that’s keeping my weight on. I’m just lazy. Oh me. WHERE IN THE WORLD on Saturday, was the Keswick pool! Condogulations to the winner who guessed correctly! Way to go Pat! 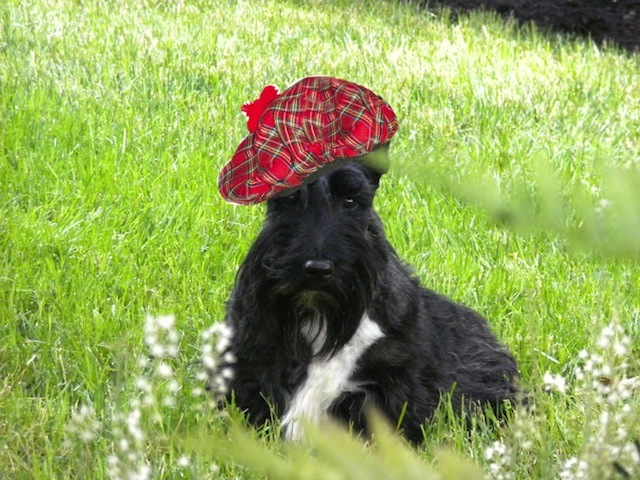 This entry was posted in Keswick, pets, Scottie health, The Scottie Chronicles and tagged animals, dogs, health, healthy dog weight, pets, Scottie weight, Scotties, Scottish Terriers. Bookmark the permalink. Is that an ice pack on your head? Hehehehe…. It sure looks like it doesn’t it? I guess I need one since it’s going to be 100 degrees here tomorrow. PEE.S. Condogulations on your egg naming skills. Apt description of my fetching tam o’shanter. I can hear you rejoicing all the way over at my house! Oh Stu, I know you are PERFECT! You didn’t need to see da doc to have him tell you! We all know you’re PAWRFECT! You do not look fat, er overweight, in any of your pictures! You aren’t fat, maybe you are big-boned! That’s what we say about my Sis’, the Cairn/Westie. She LOVES to eat and she weighs more than me, but I am in charge of getting her to move! So I chases her little rotund rump roast of a body around to make her get some exercise! I loves to run around, and when Mum takes us to the school yard to play with other doggies I have a great time running around with them, and chasing bunnies and birds and squirrels and skunks, ( I gets sprayed by them), and boy does my mom get upset that she has to give me a bath with a mixture of peroxide and baking soda and detergent for dishes to get the stink out! Anyhoo-aroo-o-o, where was I, oh yes, when I am playing around at the school yard, Sis’ just hangs out by Mum or sneeks off to the kids’ lunch tables to clean up under them! Mum gets very upset that she eats peeps junk food like crackers and cookies and stuff doggies should not eat like raisins and candy and chocolate. When Sis’ gets caught Mum tells her “get over here, Tessie” Tessie is always trying to sneak off and find nums! Mum says she is food driven. Whenever a doggie comes and asks Tessie to play she just growls at them! She is stuck-up I say, but Mum says she was scared by a big dog when she was a wee pup of only 4 months, right there at the school yard, and that is the only reason she can think of why she is so standoffish with other doggies. She does love peeps tho’. So needless to say she is 4 lbs overweight! Tessie says she is “big-boned” and can’t help it(?). Mum also ordered a thyroid test for her the last time she had a physical, and she came out negative in that dept., too. So don’t change, Stu, ‘cuz you are just PERFECT and we love YOU! Well, you sure put me at ease. And I needed that. I’m always on the hunt for nums too. This morning I got into something that made me really throw up something nasty. I won’t get into that here, but the peep was nervous about it. I just stood there and wagged my cute tail at Her so She’d know I was OK. I wish I could run around like you do, Riley Puppy. It’s just too hot and I’m too lazy. You’re a pup. Pups run around a lot. Your peep is awfully good to take you to the school yard and stuff. OH….and bark at Tessie to stay cute and cuddly. That’s what extra pounds are for! Don’t worry, Stuart, Dui just weighed in at a whopping 13 kgs. (28+ pounds). He is a BIG boy, tall and long. The vet didn’t even mention his weight! We think you’re just perfect. I can’t believe Dui is a big boy! Seems like yesterday he was just a pup. Sigh. We are doing the ‘happy dance’ here because the tests show there is nothing wrong with you. We just knew it! And, you are not fat, overweight or big boned. It’s your fur. You have a lot of fur that doesn’t lay flat against your body, and it only makes you look…bigger. Got it? We always thought that you were perfect. Glad all da numbers wuz good. You mean you wen’t at the edge of the world where sailing ships fell off the edge of the earth because the earth is flat. I’m upset, but I can’t get upset when you wear tartan. Great news!!!!!! You are perfect! Duffy goes tomorrow.to the groomer AND the dogtor 1hour later. He will h a ‘ve a stressful day, but mom will give lots of treats. Have you ever had those Beggin Strips? SHE just bought some and they are the best! I bet Duffy will get extra tomorrow. well done on good blood work! So glad to hear you’re 100% healthy! !